Fruit and Nut Balls, or you may know them as Sugarplums, are made with a variety of pureed dried fruits and nuts held together with a little honey (golden syrup or corn syrup) and a splash of alcohol (or fruit juice). I think what makes them so tempting is all the ways they can be decorated. You can roll them in different sugars (white, brown, or powdered), unsweetened cocoa powder, dried sweetened or unsweetened coconut, grated chocolate, and/or finely chopped nuts. But I must admit that my favorite way is to dip them in melted dark chocolate as I love the combination of dried fruits, nuts, and chocolate. They store very well, and while perfect for Christmas giving, they also make an excellent snack to take along on picnics or hikes when you need a quick boost of energy. Today we are fortunate to have a wide selection of dried fruits to choose from. Where once we were limited to dates and raisins, it now seems that every fruit imaginable is available dried. 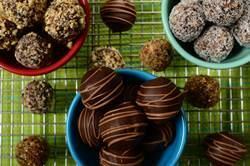 The quality of these fruits is also excellent which makes for delicious Fruit and Nut Balls. When you look at this recipe, don't think it is cast in stone. You need a total of 2 cups (280 grams) of dried fruits so feel free to vary both the type and amounts of the fruits you choose. While I have used dried dates, figs, cherries, and papapa, you can just as easily use other dried fruits like prunes, raisins, cranberries, mango, pineapple, and kiwi. But there are a few things to keep in mind when choosing your dried fruit. First, try to buy in bulk from a grocery store or natural food store that has a high turnover. Not only will the fruit be fresher, but you can see, smell, feel, and often taste the fruit to make sure it is fresh and of high quality. Pre-packaged fruit can also be excellent but it is harder to tell the quality of the fruit through the plastic bag. Make sure to check the expiration date on the bag. Always look for dried fruit that is plump, moist, and has good color. Never buy fruit that is dried out or moldy. There is a debate about whether to buy 'sulphured' or 'unsulphured' dried fruits. Some like to buy 'sulphured' which means that it has been treated with a sulphur dioxide solution. This preserves the fruit's bright color and makes the fruit very soft and moist. The downside is that some people can taste the preservative and also feel flavor is sacrificed for making the fruit look good. To Toast Nuts: Preheat oven to 350 degrees F (180 degrees C). Place the pecans and walnuts on a baking sheet and bake for about 8 to 10 minutes or until lightly brown and you can start to smell the nuts. Let cool and then coarsely chop. Fruit and Nut Balls: Have ready a baking sheet lined with parchment paper, wax paper, or aluminum foil. Place the nuts, dried fruits, candied ginger (if using), and sugar in your food processor and pulse until finely minced. Add the honey and just enough Grand Marnier or orange juice to bind the ingredients together. Shape the mixture into 1 inch (2.5 cm) balls, pressing the mixture into the palms of your hands so the ingredients stick together. Roll each ball in the desired topping(s) and place on your baking sheet. Can be stored in the refrigerator, in an airtight container, for about a month. They can also be frozen for several months. Note: If dipping in melted chocolate, chill the Fruit and Nut Balls in the refrigerator for at least an hour. Then put 5 ounces (140 grams) of chopped dark chocolate and 1 teaspoon of shortening or butter in a heatproof bowl, placed over a saucepan of simmering water. Once melted, remove from heat and dip the balls, one at a time, into the melted chocolate, making sure the entire ball is coated with chocolate. Then, with a fork, remove the fruit balls from the melted chocolate, allowing any excess chocolate to drip back into the bowl. Place on a baking sheet. When all the balls have been dipped in the chocolate, place the baking sheet in the refrigerator until the chocolate has set. Once the chocolate has hardened, if you like, you can drizzle the tops of the balls with melted milk or white chocolate (you will need about 1 ounce (30 grams)). Makes about 30 - 1 inch (2.5 cm) balls. Preparation time 45 minutes.